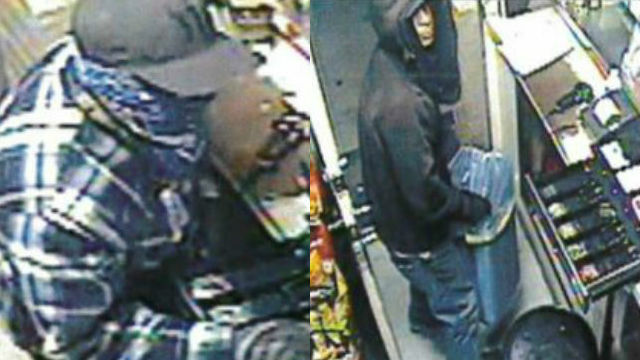 Authorities reached out to the public Friday for help in identifying a gunman suspected of robbing a gas station in the Mountain View area for the second time in five months. The latest robbery at the Chevron on South 35th Street and National Avenue happened shortly before 4 a.m. Saturday, according to San Diego police. Investigators believe the same man also robbed the gas station around 4 a.m. on June 2, which was also a Saturday. In both robberies, the suspect wore black gloves and pointed a black handgun at the clerk, then demanded the clerk open the cash register and fled after taking an undisclosed amount of cash and several packs of cigarettes, police said. The suspect was described as a Hispanic man, 35 to 40 years old, between 5 feet 6 inches and 5 feet 9 inches, and weighing between 170 and 180 pounds. He has a light complexion and acne on his face. During the first robbery in June, he wore blue jeans and a black hoodie. In the latest robbery he wore blue jeans, a black baseball cap, a blue bandana covering his face and a blue and white plaid shirt. Anyone with information about the robberies or the identity of the suspect was urged to call the San Diego Police Department robbery unit at (619) 531-2299, or San Diego County Crime Stoppers at (888) 580-8477. Tipsters may remain anonymous and could be eligible for a reward up to $1,000.